The Mini Motor was one of the best-known of the British clip-on engines, and was introduced in Great Britain in 1949. Though rarely referred to as such, the Instruction Book for the Mk 5 model (the last of them) describes it as a Gearless Cycle Outboard. The Trojan Minimotor was originally designed by Vincent Piatti in 1946 as a unit to power portable lathes; he saw its advantages as a cycle-attachment and introduced it in Italy as the Mini Motore. Five models were produced in Britain at Trojan's Croydon factory, from the Mark I in 1949 to the Mark V in 1955. The improvement for 1951 was a decompressor added to the cylinder head to aid both starting and stopping. The unit could drive a bicycle at 30 mph, which was probably as fast as you'd want to go on a normal cycle under normal road conditions. 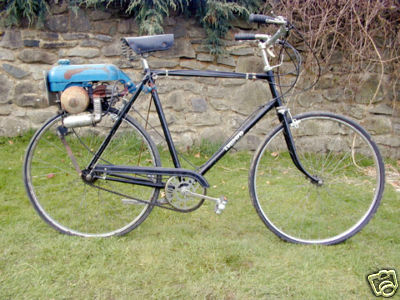 In a postwar Britain with a shortage of new vehicles, motorists found them ideal for short trips, commuting to the station or the office, or to the shops to fill up the front basket. Some were even fitted to tandems, where they proved equal to the task of hauling two people along at 20mph. This is a rare early model of the popular Mini Motor, registered soon after they went on sale in Great Britain. 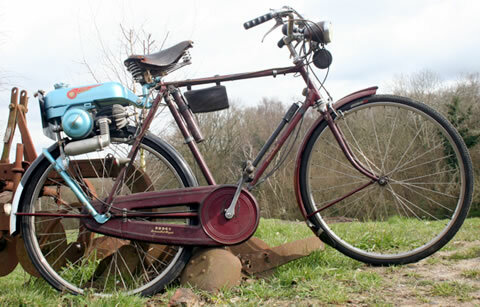 It is fitted to a period Rudge Gents de Luxe cycle in good condition with 4-speed dynohub. 1954 Mini Motor This Minmotor is fitted to a Triumph bicycle.